Have you heard all the fuss about dry shampoo? It’s seems like it’s all anybody talks about these days: dry shampoo this, dry shampoo that. What’s the world coming to? I’ll tell you what all the fuss is about: all the fuss is about catching an extra 15 minutes of snooze time in the morning. You know those days you have a hard time getting out of bed, you miss the alarm, and you throw your hair back in a ponytail to hide the grease? That’s where dry shampoo comes in. Sprinkle a little bit of this stuff on and you’re out the door with grease-free locks in a jiffy. Love that. The thing is this: dry shampoo is pricey. And you know how I don’t love the pricey. I figured it wasn’t rocket science to make your own, and guess what? You probably have all of this lurking in your pantry. Grind up oatmeal in a blender. You want it to be fine enough to be able to go through a salt shaker, so give it some time in the blender. 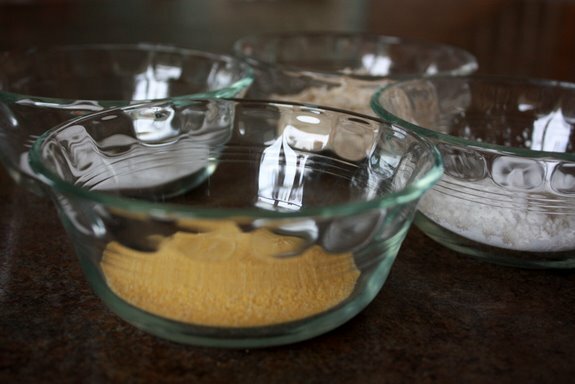 Measure out 2 tablespoons each of: cornstarch, cornmeal, baking soda and the ground up oatmeal. Mix it all together in a bowl and you’ve got yourself some dry shampoo. Pour your fancy new dry shampoo into a container. 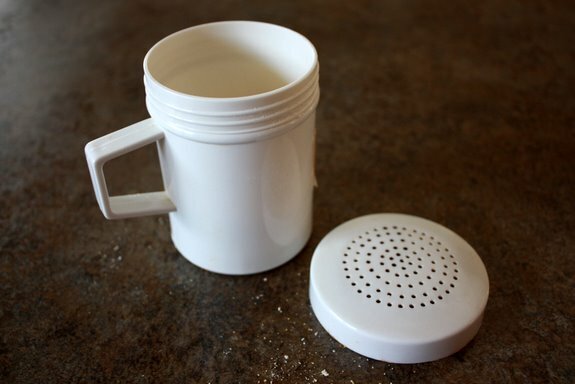 You want this to be something you can use over and over again, in the bathroom in your morning rush, so put it into a reusable salt shaker or something of the sort. Step 4 is all about embracing the fact that greasy hair is not desirable. Skip straight to Step 5 for the skinny. 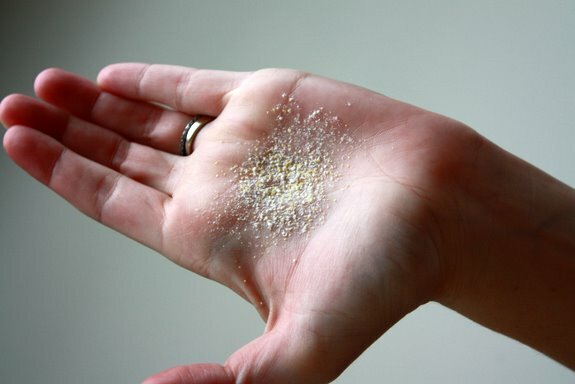 Sprinkle some dry shampoo onto your hand. Or sprinkle it straight onto your scalp. This is your head, I’ll let you make the executive decisions here. Now this part, it’s a little ugly. 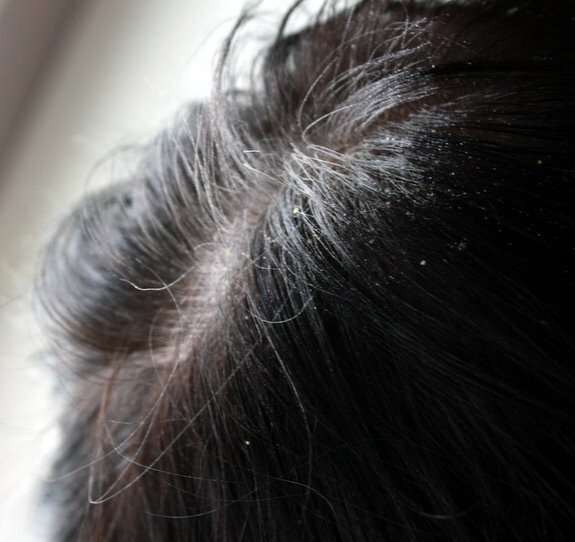 This is where you have enough stuff in your hair to feel like you have really bad dandruff. You might want to do this over a sink or tub, it’s a tiny bit messy. Scrub your head like you would in the shower, all lathered up. This is where all the ingredients you’ve so carefully blended gather all the oils on the top of your head. Now brush. 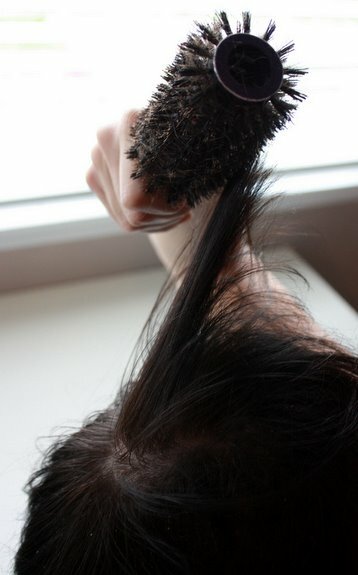 Use a bristle brush or it won’t work properly. Again, do this over a sink or tub. Brush like you’ve got the wind at your back. You need to get all this stuff off your scalp, and hurry! That’s it! You’re all dry shampooed. And even if you don’t smell like a million bucks, you sure look like it. Style your hair like you normally would, and pat yourself on the back for the extra 15 minutes of sleep you managed to score. You’re smart like that. Dry shampoo, in 10 steps or less. awesome! is it weird that i know someone who would love to save 15 minutes in the morning that this is just calling their name for a cute shaker and will be a stocking stuffer? yeah….probably. p.s. do people tell you that you’re wearing your rings the “wrong” way? that’s how i wear mine, and i get that a lot! i think THAT is weird. No, it’s not weird at all, I AM that person! Thanks Allison! I have always wondered about that!! 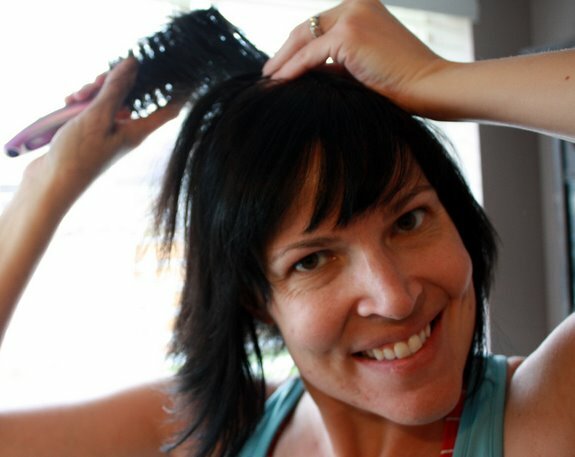 Funny thing – or not so funny – my 11 year old daughter had VERY oily hair! She has to shampo daily or it looks horrid! Poor thing! I might give this a try and see if it works for her! Thanks so much!! I have to shampoo my hair every day too Suzanne, and it’s a pain in the bum. Not only that, it’s not great for those of us who dye our hair regularly. Genius!! I’ve used baby powder before, but I wasn’t thrilled about that. This is a GREAT idea. And yes, 15 extra minutes makes all the difference. Yay! Thanks Allison!! Absolutely love your blog. Yeah, I’ve tried baby powder before with MEH results. I actually really, really like this mix. Thanks so much for the kind comments, they make my whole day happy. Ah, man. You had me until Step 7. Curly hair + bristle brush = giant fro. But I’m happy for all you well-rested, straight-haired people. Really. Happy. Dude, try it with just a regular brush and see what happens. Seriously, it can’t be bad. Yeah, I was also right there until step 7. Due to my curly haiir, I haven’t touched my head with a bristle brush since 6th grade (and you don’t want to see those pictures). I’m wondering if the dry shampoo will just shake out, or end up a big, embarassing mess. I might try it this weekend anyway. Anne, try it anyway. Let me know if it works without a bristle brush anyway. I think as long as you get it out you should be all good. I dont use a brush because of my waves, I take a towel and re-shampoo gently but briskly with the towel JUST on the hair closest to the scalp. FOR THE CURLY GALS: I dont use a brush because of my waves, I take a towel and re-shampoo gently but briskly with the towel JUST on the hair closest to the scalp. I AGREE! I have curly hair too. ;) Plus, I don’t see how *any* dry shampoo saves time. I mean, whether, it’s dry or wet, you’re still lathering, brushing and trying to get the gunk out of your hair .. 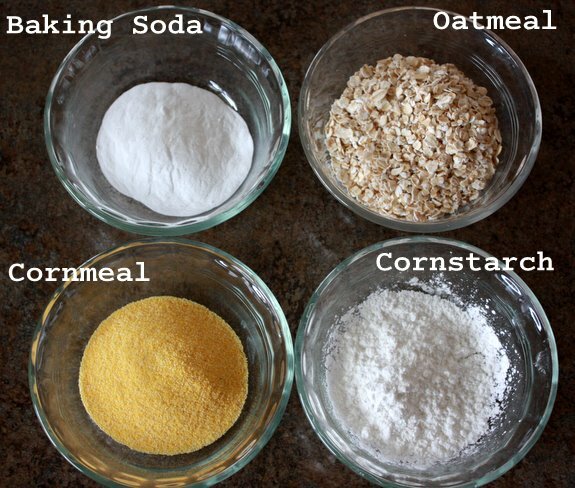 I would imagine that trying to get cornmeal, oatmeal, etc. would be more difficult to get out than it is to remove wet shampoo. *shrugs* Whatever tickles your pickle ..
Kellie, it saves the hair though, for those of us who have to wash every day, and those of us who dye on a regular basis. okay, so i’ve almost bought dry shampoo at sephora a number of times. i think the idea is brillant. in college we used baby powder but can make your hair look mustier and if you pat it will leave a cloud of powder smoke. i’m definitely going to try this, brilliant, thank you! The baby powder trick seems to work for some people but I’m not a big fan. Try this and let me know if you like it any better, I do! Haven’t tried the dry stuff yet but I’ve been making my own shampoo with castile soap and essential oils. It is super dee duper. Also make my own toothpaste, deodorant, and laundry detergent. Mucho mucho mucho less expensive and no nasty unpronounceable things. Whoa, that’s serious business Dina. Way to go! My first thought when I saw this was “Yeah yeah, and of course I won’t be able to use it on my very dark brown hair”–because most others it turns my hair white-ish and looks way weird. But I was curious so I kept reading, FORTUNATELY! :) Because then I saw that you have dark hair too (I’m a new reader) and I got very, very excited. Especially because all of those items really are lurking around my kitchen. Thank you SO much! I will need this dry shampoo during these chilly winter months when I’d rather cuddle than get up and shower. Jenn, I have VERY very dark, black hair and you can absolutely get it all out. If it doesn’t show in my mousy hair, it won’t show in yours either! I am going to have to give this stuff a try! I have been using baby powder and then instead of brushing it out I atually blow dry it for a minute and all the residue is gone. Amy, I think the general consensus is that baby powder CAN be used, but it isn’t preferable. Try this and let me know what you think! I’ve tried pretty much every dry shampoo on the market. (I have Mixed Connective Tissue Disease which is a close relation to Lupus among a few other AIs and sometimes it is too much work to wash my hair because of the pain and fatigue.) PSSST! used to be my go to. Cheap and super effective, but they changed the formula and if I use a flat iron after dry shampooing it smells funny, kinda like it’s frying my hair. So that’s when I started trying everything on the market. Best expensive dry shampoo is Klorane Gentle Dry Shampoo with Oat Milk 3.2 oz for $18 on drugstore.com (I’ve use this if my head is a bit itchy due to being dirty–TMI? lol–and it works like a dream) and the best cheap one is Batiste Dry Shampoo, Original 5.05 fl oz for $7.99 on the same site (my go to). FOR THE CURLY GALS: I don’t use a brush because of my waves, I take a towel and “re-shampoo” gently but briskly with the towel JUST on the hair closest to the scalp. Thanks so much for all the help! If you don’t mind, I’m going to add your suggestion about the towel into the body of the post so the curlies out there can enjoy the benefits of dry shampoo! That’s fine by me, she says a week late. lol Sorry! I have to wash my hair every day too, and I hate it. This gives me just a little bit more down time on the shampoo front. Thanks for the tutorial, and the tip about a bristle brush. 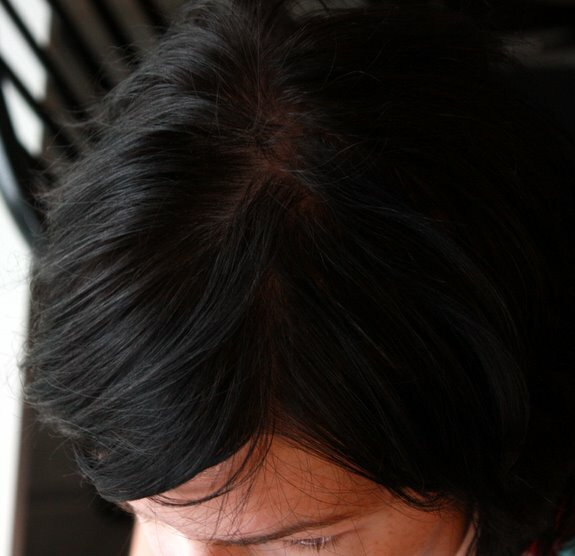 I have dark hair, too, and after trying the spray-on dry shampoo had pretty much decided it just won’t work for me. Looking back, I think I probably used WAY too much and just didn’t brush it out enough. I gave my store-bought stuff to my mom, so I may give your recipe a try, now that I see it can work for brunettes! I think the key with dry shampoo really is in getting it all out. It has to absorb the grease and then get out of there fast! Try it, it totally works! Whoa! Brilliant! I have the Oscar Blandi Dry Shampoo and it was so expensive! Luckily it lasts a while, but this is a wonderful alternative! I’ve never tried the expensive stuff, but I’m sure at some point I’ll cave. I always do. Thanks for the step by step Allison. I did a wee bit of research a while ago and tried using a mixture of baby powder and baking soda before we came home from Japan. I felt like I had a bad case of dandruff and knew I was doing something wrong. Everything I read talked about how dry shampooing is best left to towheads. Thanks for giving me a great guide and proof that blondes aren’t the only ones who get to hit the snooze button! No, not for towheads at all! My hair is as dark as they come, you just have to make sure you get it all out. Try this recipe and see if it works out better. I think the cornstarch helps. have you tried to add essential oils to this at all? I was thinking about trying a little lavender in it…..
Kelly, I thought about it, but didn’t end up doing it. You ABSOLUTELY can add essential oils so it smells lovely on your head. I love this idea! I bought some dry shampoo, but it seems to go quite quickly (which may say something about my snoozing habits!)! And I just think you are too too darling! You just made my morning. THANK YOU. Thanks so much for this recipe! My daughter keeps bugging me to buy her some expensive dry shampoo, but now I can challenge her to make her own. Perfect! Yes! Make it, it’s so much cheaper and lasts forever. 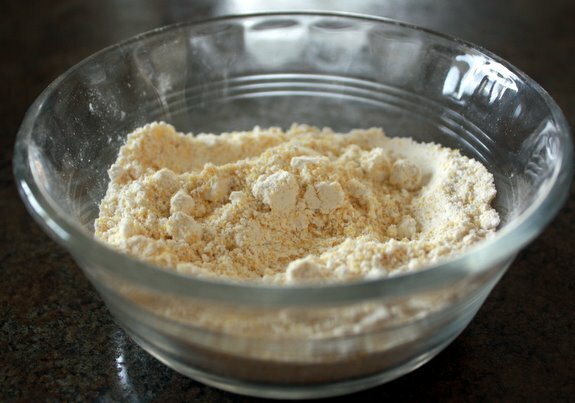 I’ve been using straight up cornstarch for several years now, but I have blond hair, so it blends in pretty good. I’ll have to try your recipe to see if I like it better. I have a can of cornstarch in my bathroom cabinet, and I use a big makeup brush. Dip it in the cornstarch, tap of the excess and pounce it over the greasy areas. Then brush through it as you do. Works great! Ooo, yay! I hate having greasy hair when we go camping and there isn’t a place to wash, this will be my life-saver, thanks!